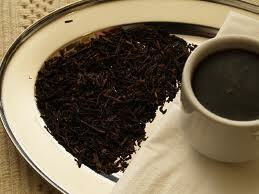 Based on the ancient Chinese system of defining tea by color, black tea was originally classified as red tea. That’s because the class of tea known as Pu-erh was originally called black tea. In determining how to describe the currently known black tea, tea makers may have considered the coppery-red color that temporarily occurs during the processing of the tea. But somewhere along the way Pu-erh (a fermented tea) took on its new name, making room for our current description of black tea. While, today tea is classified into one of the 6 classes of tea by the different processing steps used to manufacture tea, the name “black tea” does describe the final coloring of the tea, which is a rich, brown-black color. But the coloring still doesn’t give us a definition of black tea, the second most consumed beverage in the world, running just behind water. Black tea comes from the buds and leaves of the Camellia Sinensis plant, or the tea plant/bush, as do the other classes of tea – Pu-erh, Green, Oolong, Yellow and White – the difference being in how the tea buds and leaves are processed into drinkable tea. In the production of black tea, and unlike green, yellow, white, and sometimes Pu-erh tea processing, tea leaves are put through significant enzymatic changes called “oxidation” that gives us the rich, bright, full-bodies flavor (and color) associated with black tea. 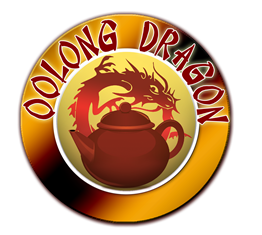 Note: oolong tea is considered a semi-oxidized tea, for more on that process see the article on Oolong tea. Yellow and white teas are minimally oxidized, and green tea is not oxidized at all. Black tea manufacturing can have one of two outcomes: orthodox or Crush-Tear-Curl (CTC). The highest quality black tea is a full-leaf orthodox tea. 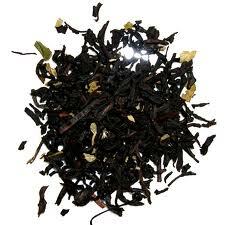 CTC black tea undergoes one or more additional processing steps to crush and tear the leaves. This article will focus on the making of orthodox tea. From the picking of the leaves to the finishing stages, each step in the processing of black tea builds on the previous step. If a step is not completed or the outcome of any step is of low quality, the final tea will be of inferior quality as well. Uniformity, or consistency in size, is a key factor in plucking tea leaves for a batch of any tea. The leaves should all be of about the same size. Which leaf on the plant that is picked for a particular type of tea varies; but in the case of black tea, the typical plucking methods are as follows. A budset or “fine pluck” – plucking from new growth on the tea bush, considered premium plucking and is the first choice of tea plucking for high quality tea results. A coarse pluck – plucking from more mature leaves; these leaves contain less moisture but have a tougher skin, which necessitates a longer withering time. After plucking, the leaves are then sorted to flush out any that are not of consistent size, along with any other twigs or debris that may have worked its ways into the leaves. Getting a uniform size in a batch of tea leaves sets the first stage for success in the next stages of uniform drying and uniform oxidation. The freshly plucked tea leaf has a moisture content of approximately70 to 75 percent. To bring the leaf to a manageable state where it will be pliable during the next steps of the process, the tea manufacturer must drive off some of the leaf’s moisture, bringing it to 60 to 65 percent. This step is called the physical drying stage and it is done by setting about 6 to 8 inches of leaf in specially constructed tats or troughs that have a controllable air circulation and venting system, which allows air to flow up through the leaves, sometimes surrounding the leaves (in the case of a covered trough) to drive off moisture. The tea leaves are typically not tossed during this initial drying, so as to not tear or bruise the leaves, but by controlling the air current, the tea makers is able to “fluff” the leaves. When the moisture in the leaves reach 60 to 65 percent, the chemical drying state spontaneously kicks in, setting in motion changes in the leaf’s biochemistry that are so necessary for the good drinking or “cupping” qualities of black tea. The “juice” of the leaf is converted into complex liquoring compounds. In this stage, another 10 to 20 percent of the leaf’s moisture is removed as well. Chemical withering of orthodox black tea takes about 16 hours. 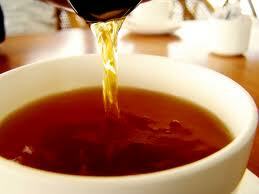 During this time of changing chemistry caffeine levels rise in the tea leaf as do polyphenol levels. Upon completion of the chemical withering stage, the leaves release a distinctly fruity aroma – the results of proteins and carbohydrates in the leaves breaking down into amino acids and simple sugars. The next stage of black tea processing, called “rolling”, serves a couple of purposes. The first is that pressure applied to the leaf bursts the leaf’s cell structure and releases its inherent juices, freeing enzymes, and spreading them evenly throughout the leaf. Doing so, allows enzymes to mix with polyphenol compounds (catechins), thereby setting up the chemistry that will feed the oxidation process, turning the tea leaves into flavorful black tea. Rolling was once done by hand by squeezing, wringing, rolling, or pressing the leaves against a hard tabletop, but today machines have taken over this process. To be ready for oxidation, the highest quality tea is of uniform size (obtained by sifting), aerated, cool, and is evenly covered with enzyme juices. Successful rolling will take care of the uniform spreading of enzyme juices, however, an outcome of rolling the leaves is that they clump together and must be de-clumped. De-clumping the leaves is done by aerating the leaves, turning them into individual leaves again. The same process serves to reduce the temperature of the leaves. The leaves are subsequently sifted for uniformity. They are not ready for oxidation. Oxidation is an abundance of chemical reactions occurring simultaneously within a very controlled, bacteria-free, oxygen-rich environment. This step requires the expert eyes and nose of a tea master to know when it’s complete, but usually takes about 2 to 4 hours. Tea leaves ranging from 2 to 3 inches deep are spread on tables in oxygen rooms or chambers where humid air exchanges occur 15 to 20 times per hour. During this time the leaf temperatures and relative humidity must be controlled, typically by raking them, to about 85° F and 98%, respectively. The chemical changes in the leaf are quite remarkable during this time, and complex. It is a time when enzymatic polyphenols act on other polyphenols to produce theaflavins (temporarily causing a red-coppery color to occur in the leaf), which react with more polyphenols to produce thearubigins, the chemical responsible for creating the dark, rich color of black tea. Thearubigins in turn react with amino acids and sugars to create the distinctive flavor components of black tea, namely, it’s brisk, bright flavor, and rich, full body. Once the tea master determines that oxidation has completed, the leaves are then put through a drying process. This final drying, when heat temperatures are at a minimum of 130° F, stops all biochemical activity, thereby also stopping oxidation. Additionally, moisture in the leaves is reduced to a mere 3%. Drying in the phase is done by machine, such as a drum-dryer or tumble-dryer and takes only 15 to 20 minutes. The tea is then cooled quickly to prevent overheating and loss of flavor. Once the tea is cool and stabilized, it is no longer just tea leaves, it is tea! The tea is then sorted a final time, graded, and packaged for selling and storage. Manufacturing black tea is an intricate process and this article only touches on the work and machinery involved to bring it to our tea tables, but it provides a good picture of what is involved in the process, perhaps making us appreciate more this robust, drink, and the people who bring it to us.